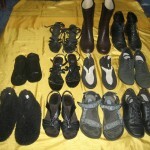 My first shoe purge in 2010 got me from 30 pairs of shoes to 13 pairs – the national average. This was progress, but since I work at home, heels hurt my feet, and I really don’t care much about shoe fashion, I felt that certainly I could do better. 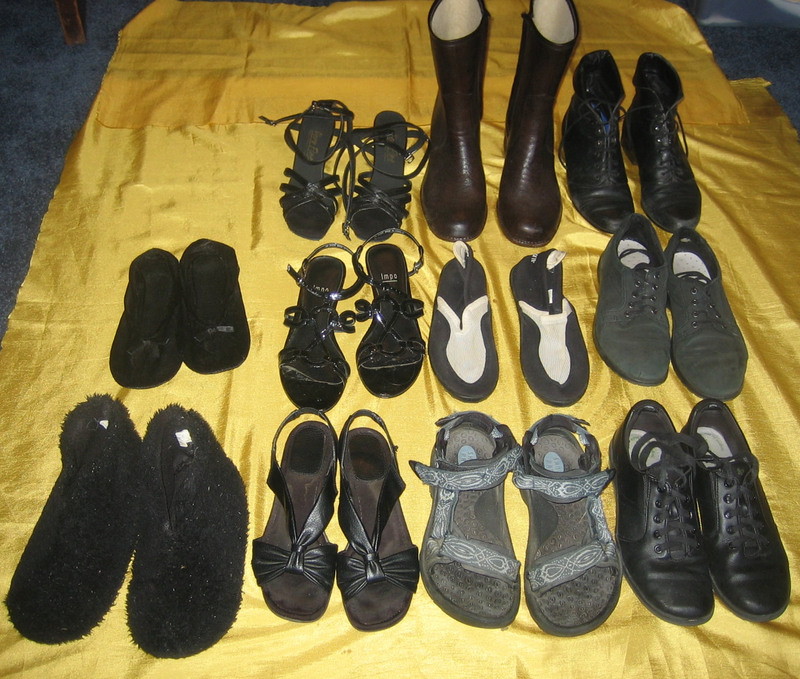 I just reviewed my shoe wardrobe, but was only able to decrease it to 11 pairs. This doesn’t sound like much reduction but my rationale is that I bet the national average does not include boots and slippers. I’m counting everything! Today, instead of showing what shoes I’m giving away, I decided to take a photo of which shoes I’m keeping and why. In studying my shoes I realized that 90% of the time I only wear 2 or 3 pair. The other shoes are for back-up or special occasions. Why not give away all those extras? Good question. My justification is that it would be a waste of time and money to go out and buy a fancy pair of shoes for the once or twice a year dressy event I might go to. Likewise, even though I only need snow boots several times a year, I want to have them around when it does snow. So this is the best I can do for now. Do any of you, simple-lifestyle loving readers, have other solutions to taming the multiplication of shoes? PS: Oh oh! I just realized that I have two pairs of shoes in my dance bag that I only use for contra dancing. I forgot about those when I took the photo and counted. But I really must have those and do wear them weekly. Hmm, maybe the Oscar shoes can go and I could wear socks instead of travel slippers.